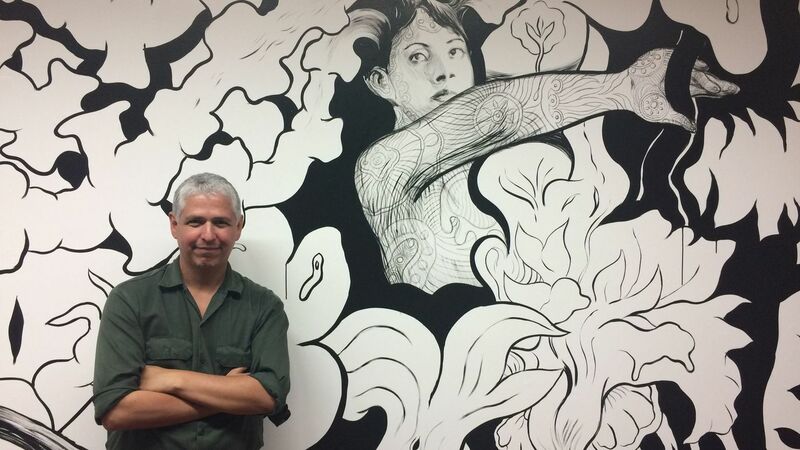 Throughout the month of September visitors watched artist Hugo Crosthwaite produce a new mural inside the Museum of Social Justice. The mural wrapped the gallery walls and was completed in a matter of weeks before the artist began to deconstruct it. In February, he slowly painted out the mural, bit by bit. 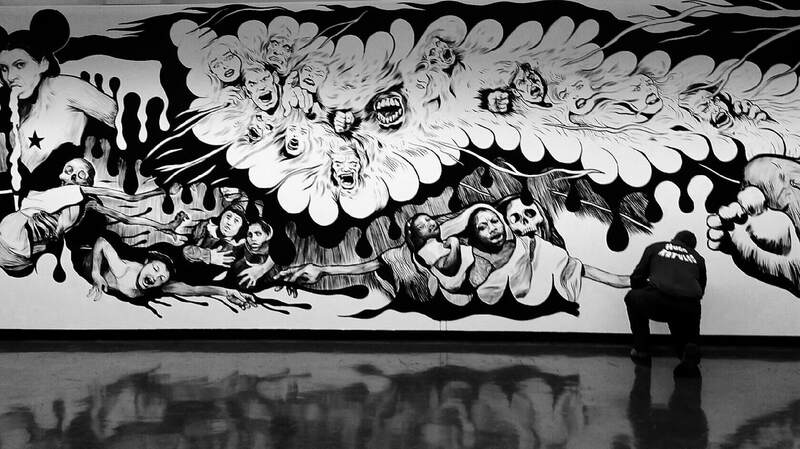 This mural as a performance is part of a series he calls In Memoriam, which the artist has been painting across the US and abroad. Visitors were encouraged to speak with him, ask questions, or just watch him paint. Crosthwaite works in a style which brings together portraiture of ordinary people, comic book characters, street signage, urban facades, and mythological references, among other things, into a dense and layered composition. His work reflects the character of frenetic urban settings, especially border towns like Tijuana where the artist lives. Fear, hope, sorrow, and celebration are all represented together as he incorporates his observations of daily life. He elevates the ordinary person to heroic showing the trials they endure in surviving and thriving in our contemporary cities. Through his work, Crosthwaite invites us to have compassion for people who struggle in the margins of society. For In Memoriam: Los Angeles, Crosthwaite observed people in the local Los Angeles downtown area as he worked in an improvisational manner to complete the mural. Working only during the museum's open hours when visitors could observe, his interactions with the public influenced the mural. At the end of the exhibition, the artist produced an animation from still photographs taken throughout the process which shows the painting’s production from beginning to end. This exhibition was co-presented with the California Historical Society, courtesy of Luis De Jesus Los Angeles. Watch the complete creation of In Memoriam Los Angeles and the beginning of its deconstruction. DEC 27, 2017 - "When artist Hugo Crosthwaite walked into the Museum of Social Justice in early September, he had little idea what he was going to do with the walls he’d been commissioned to paint. But over the course of several weeks this fall, the artist let a rambling narrative unfold — one inspired by whatever took hold of him on any given day..."